The vapour steams of the preliminary stage, which are produced by evaporation of the solution, are used as heating medium for the following stage. The solution enters the evaporator circuit of the first stage. Here it mixes with the circulated solution and is heated in heater H with steam. In the evaporator V1, solvent (water) evaporates while cooling the solution to the boiling temperature. The solution then flows to the second stage, which is operated under reduced pressure and thus at a lower temperature. 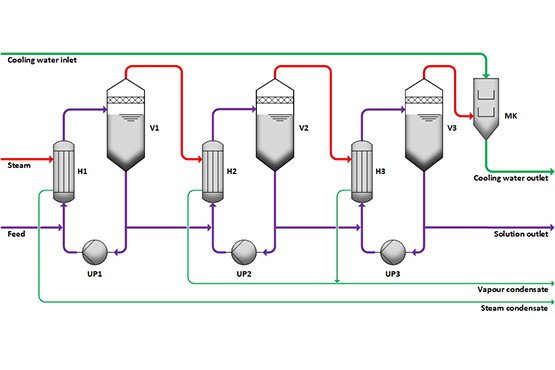 The vapour generated in the first stage is used as a heating medium for evaporation of the solution in the second stage. This process can be repeated several times depending on the boiling point elevation of the solution and existing frame conditions. The vapour of the last stage is condensed via cooling water. If salt shall be crystallized in the plant, further evaporation concentrates the solution to such an extent that crystals are formed. If desired, the crystals in the suspension can then be separated from the solution and dried. Reduction of the use of live steam by using vapour steams from the previous stage as heating medium for the following stage.